What's better than cherries and berries? 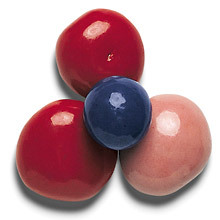 Candy coated and chocolate covered dried cherries and berries! Try these today and find out why they are just so special and tasty. Contains chocolate covered Cherries, Strawberries and Blueberries. Price quoted is per pound, not including shipping. Ingredients: Chocolate (sugar, cocoa mass [processed with alkali], whole milk, cocoa butter, soy lecithin, vanilla), pastel coating (sugar, palm kernel and palm oils, whey, nonfat milk, soy lecithin, vanilla), white chocolate (sugar, cocoa butter, whole milk, soy lecithin, salt, vanilla), dried cherries, dried strawberries, dried blueberries, sugar, artificial colors (red 40 lake, blue 2 lake), color added (vegetable extracts, carmine), natural and artificial flavors, citric acid, tapioca syrup, tapioca dextrin, confectioner's glaze.